This stamp is called Mimosa Bridge. Mimosa is one of the sweet little girls in the Bildmalarna line. 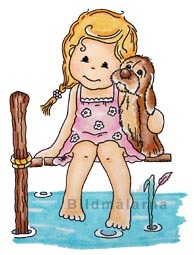 Here she is sitting on a dock over the water with her little puppy dog. This measures approx. 3 3/8" tall x 2 3/8" wide.